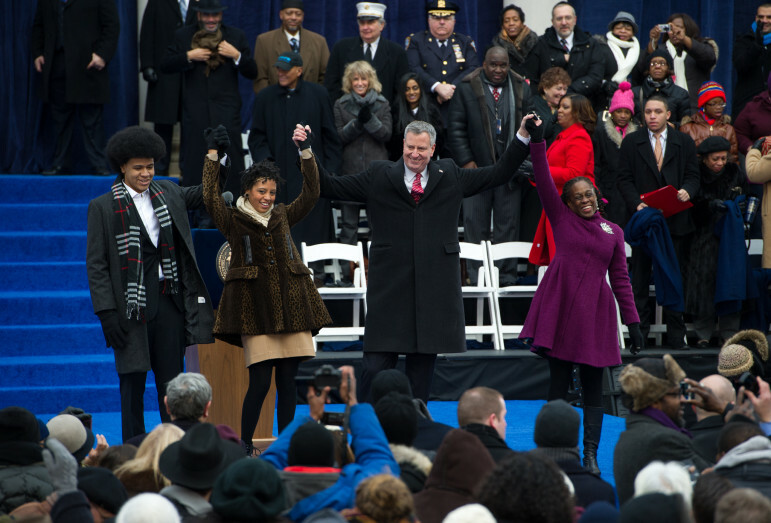 Inauguration Day, 2014: As the de Blasio family greeted the crowd, Dasani Coates, the subject of a newspaper series about homelessness during the Bloomberg era, looked on from the second row of seats. On the frigid day he took the oath of office outside City Hall, Bill de Blasio sat just a few seats from Dasani Coates, the girl whose saga narrated The New York Times devastating exposé of homelessness in the waning days of Michael Bloomberg’s era. Her presence hinted at the high stakes, both human and political, that homelessness presented to the new mayor. It seems strange then that de Blasio has so far escaped any heavy criticism over the rising number of families entering the shelter system on his watch. Month after month last year, the tally rose—by 132 in February, 206 in May, more than 300 over summer and 800 or so in the fall—so that by the end of his first year in office, the mayor had presided over a 14 percent increase in the shelter census of families with children. But in the first two months of this year, the family homeless number has shrunk by 2.4 percent. The 1.25 percent decrease in February was the largest month-to-month drop in nearly four years. More important than the slight ebb was the likely reason for it: that new programs created by the de Blasio administration were finally gaining traction at moving people out of shelter and into housing. So far, it seems homelessness-policy advocates have given the mayor room to accomplish the enormous task of reversing the failed policies bequeathed to him by his predecessor in City Hall and complicated by his old friend in the governor’s mansion. Mayor Bloomberg set a goal in 2004 of reducing the homeless population by two-thirds in five years. With that goal in mind the city boosted programs to prevent homelessness and to help people stay out of shelter when they leave. At the same time, transfixed by the idea that people were entering the shelter system in order to get near the head of the line for housing benefits, the Bloomberg team ended the link between shelters and public housing apartments or Section 8 vouchers. To replace those benefits, they created a new program called Homeless Stability Plus, which offered a time-limited rental subsidy to a narrow set of families leaving shelters. Assailed by advocates as unworkable, HSP was soon withdrawn by the Bloomberg administration and replaced with the Advantage program, which offered two years of rental assistance to working families living in shelters. Advantage wasn’t beloved either. DHS and the homeless advocacy community argued over whether it was making any permanent dent in the population of families falling into the shelter system. In 2011 Gov. Cuomo moved to cut state funding for it. Some advocates cheered the governor on, hoping it would force the city to come up with a better policy; others worried that the mayor would call the governor’s bluff. The latter bet was the right one: The Bloomberg team pulled city funding out of Advantage, too. With the exit door nailed shut, the shelter population swelled, leaping by a quarter by the end of Bloomberg’s third term. It was clear from the outset that de Blasio would have to come up with a new rental subsidy program to replace Advantage. The mayor did make other early homeless policy moves—like removing families from two notoriously grim shelters depicted in The Times’ Dasani series and increasing funding for homelessness prevention. But the flagship program was the new rental subsidy, which the administration began talking about publicly in February. Resistance from the Cuomo administration was swift. First, the governor suggested that the mayor’s proposals had come too late in the budget cycle to make the state’s 2014-2015 spending plan. The governor ultimately blinked, but there was more discord when his administration began negotiating with the city over the shape of the program. The state insisted that its rent levels be set lower than for Section 8, as they had been for the Advantage program. Those lower rent levels nearly sank the new effort—dubbed Living In Communities, or LINC—at the pier. Six weeks into the LINC program, uptake by landlords was so slow the de Blasio administration exercised its authority to raise the rent levels. The maximum rent for a two-bedroom jumped from $1,200 to $1,515 a month. After the rates were raised on November 7, enrollment by landlords increased. By the time Department of Homeless Services Commissioner Gilbert Taylor and his Human Resources Administration counterpart Steven Banks testified at the City Council on January 21, some 328 families encompassing 1,072 people had moved out of shelters under one of the LINC programs. Another 1,600 families have been certified for the program but hadn’t found apartments yet. LINC now has five variants. LINC 1 is for families with at least one member working 35 hours a week and employed for the past 90 days. Households in LINC 1—which aims to serve 1,101 families—pay 30 percent of their income toward rent. The state has committed $40 million to LINC 1 over four years and the city is supposed to at least match that. As of January 21, 132 families had moved out of shelter under LINC 1. LINC 2 is for families who’ve had recurring shelter stays—at least two stays of a month or more, one of them in the last five years. These 950 families must have some work income and be receiving public assistance, and will pay 30 percent of their income toward rent. The $15 million a year for LINC 2 comes from federal, state and city funds that DHS saves by not having families in shelters. There were 56 “move outs” under LINC 2 by mid-January. LINC 3 is for 1,900 families who’ve experienced domestic violence. Their rent will be calculated based on their public-assistance benefits. The city is paying for LINC 3—under which 140 families had moved out by mid-January—itself. The city is also funding on its own LINC 4 and LINC 5, which were developed after the other three programs were already rolling out. LINC 4 is for 1,100 medically frail or elderly single adults or adult families in the shelter system and LINC 5 is for working singles and adult families and will serve 1,000 people or families. For both programs, rent is set at 30 percent of income. Some 77 people have moved out of shelter under LINC 4 and LINC 5. The late introduction of the programs for single adults and adult families might be reflected in the shelter statistics for both groups: While the number of families with kids decreased in January and February, the city posted new highs each month for the number of adult families and single adults in the system. Homeless policy advocates, some of whom made no secret of their disdain for the Bloomberg-era DHS (which was reciprocated), have largely cheered the de Blasio administrations efforts. “We want to commend them for creating at least a path now for people out of shelter for the some 60,000 folks that are in shelter,” Christy Parque from Homeless Services United told the Council in January. For Lucinda Lewis, an advocate with Picture the Homeless who describes herself as chronically homeless, the concern is that the temporary nature of the LINC programs will simply delay families’ return to shelter. Other than LINC 4—the one for the elderly and frail—LINC benefits are limited to five year. “To me, this won’t be a concrete, long-term program,” Lewis said. “Due to the similarities between LINC, HSP, and Advantage, we will see the same rate of recidivism as we saw when those two programs ended. I am living testimony. A broader area of contention is the de Blasio administration’s decision to set aside for the homeless only 750 of the 5,500 or so apartments that become available every year within the New York City Housing Authority. Advocates, who for years had protested Bloomberg’s move to cut the link between homeless shelters and NYCHA, had been pushing for at least twice that. Councilman Steven Levin, chair of the general welfare committee, called the public-housing set-aside “a fraction of what is needed,” and others have noted that NYCHA is the only housing resource that is entirely under the city’s control. Asked about the NYCHA numbers, City Hall says it is trying to be fair in divvying up public-housing resources sought by the homeless but also by veterans and others. For its part, NYCHA says it placed 865 homeless families in public housing and another 291 in Section 8 units in 2014. “With the current waiting list of more than 250,000 people, NYCHA strives to give all New Yorkers in need fair access to housing. NYCHA’s new leadership is committed to expand housing opportunities for all New Yorkers in need, and support the city’s efforts to move families out of shelter and into permanent housing,” the authority said in a statement. Homeless policy is not just about the programs in place to prevent people from needing shelter, or to help them get out of it once they’re there. There are also the shelters themselves. And one key change from 2013 to now is that “New York City is not wrongfully denying homeless families access to shelter the way the Bloomberg administration did,” as one advocate puts it. That widened path to shelter might be one reason why the homeless census jumped in de Blasio’s first year. The slight decrease so far in 2015 in families with children living in the shelters could be an aberration or the subtle start of a positive trend. State funding will be a factor in deciding which way it goes. In his visit to Albany last week, de Blasio said he wanted from the state “$32 million in funding this year, and more in future years, for rental assistance to prevent and alleviate homelessness” by preventing evictions and supporting LINC 3 and LINC 4. De Blasio also described as “ill-considered” a proposal to cut $22.5 million in emergency assistance funds to the city. “That money would provide shelter for 500 families for a year,” he said. Cuomo’s budget does propose a rebate to the city of $55 million Albany would normally charge for juvenile detention placements, with the savings meant for homelessness programs. But advocates contend that doesn’t represent real, new money. Meanwhile, de Blasio and advocates all deride Cuomo’s commitment to supportive housing. Supporters want the state to follow the 9,000-unit NY/NYIII supportive housing initiative, which is winding down, with a 30,000-unit NY/NY IV, but the governor’s budget falls short. Cuomo’s proposed program, de Blasio testified, “provides less than half the number of units to New York City that NY/NY III did, even though the homeless population is now twice as large” and tries to stick the city with coming up with money to cover the services provided at supportive housing facilities. After a one-on-one meeting with the governor, de Blasio was asked by reporters whether the two had discussed the proposed cut to city homeless funding. This is a great analysis of city homelessness policies – and the first reporting to recognize that it’s beginning, if excruciatingly slowly, to work. Great work Jarrett Murphy. FYI…Housing Stability Plus not Homeless Stability Plus. Overall good article although two months of data is not a trend. I do hope to continue to see these shelter numbers decrease. Cuomo’s dad is spinning in his grave over his son’s betrayal of the poor and disenfranchised and disabled. Youth who’ve left foster care have long been part of the city’s larger homeless population. The de Blasio administration is taking steps to address the issue, but advocates are pushing for stronger action. Moves by real estate companies and analyses from city agencies yield a blueprint for where affordable—and not so affordable—units could go in the borough with the city’s lowest rents and highest poverty. City Limits maps them. Myth: Rent-controlled tenants get an unbelievable deal. Reality: They can be hit with huge annual rent increases. That’s why advocates want the shrinking number of rent-controlled apartments added to Albany’s looming discussion of rent regulations.